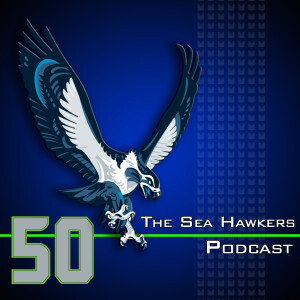 Not only are we celebrating a win over our NFC West rivals on Thanksgiving, we are also celebrating our 50th show. To commemorate the occasion, we form our own legion of Seahawks fans and start with a guy who is in fact a member of Mama Sherman's Legion of Super Fans. Cedric James Morris joins the show to talk about how he got the effort started to get Richard and Beverly Sherman highlighted as the new face of Campbell's Chunky Soup. Right after we launched last week's show, Richard Sherman and Doug Baldwin performed an epic skit/press conference and we talk about a recent article about Marshawn Lynch considering retirement. Next on our guest list and considering Jenny Goos has been our most frequent guest over the past 50 shows, she was a clear choice to bring on the show especially with her recent selection as STAR 101.5's 12th Woman of the week. We move on to preview the matchup with the Eagles and then chop it up with our final guest of the day, Norb Caoili who has been entertaining us this year with his recent Rivals video series. Norb also talks about his Norb-Cam videos and the reason for the shift from YouTube to Vimeo for catching his game reactions and recaps. Before we get into the second half of the show, we squeeze in a call that came in right after we finished recording for this week. It was just too good to leave out and it involves an offer to buy beers for Adam and Brandan when the Seahawks make the playoffs. (It had to be officially documented.) Then we get to your latest reviews, offer our nominees for”Do Better!” and announce our picks for who is better at life than Skip Bayless this week.